So hear me out, how awesome would it be to mix a game like Sins of a Solar Empire — real-time bombastic galactic RTS — with a game like Battlezone or Uprising — first person control of battlefield units while also taking part in the battle — to make one giant first person space sim/RTS/4X thing? How would such a thing work? It would need Distant Worlds-style automation here and there, but here’s what I’m thinking. You’re in some sort of superfighter, making you powerful, but agile. While many 4X games put you behind a desk or in a map room, here you’d be commanding your forces from WITHIN your fighter. This could be done in first person mode — i.e. place a factory at your crosshairs — or using a minimap in the cockpit. You could also fly down to the planet and do the same thing — might be too much for some folks here, but that’s where automation would kick in — so you can set up the industry and defenses on your homeworld. THEN, while your mines are mining and your factories are producing, you use your factories to build ships to explore and colonize, AND YOU CAN JOIN THEM IN YOUR SUPER FIGHTER to do the same thing on a new planet. 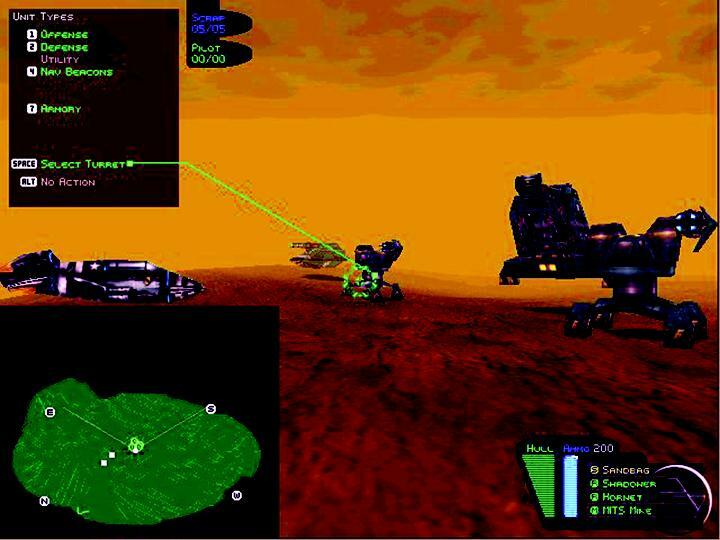 If necessary, you could remotely control gun turrets and such if you were in another system, just like in Uprising, lest your homeworld or colony come under attack, or you could try to jump back in time to take part in the combat first-hand. Imagine having this kind of direct control over several planets, all of which you could jump back and forth between. Now you’ll totally build ships larger than your command fighter, but as in games like SOL: Exodus, you could dock into specific ships and take a more wide-range control if you’d like, which then makes it more like a larger meta game. 1942: Pacific Air War did this superbly, as it gave you fleet command and control, then allowed you to jump into a fighter when you wanted to take part in a furball personally. Total Air War also had this kind of feature. Now, you wouldn’t be the admiral in charge of these fleets, you’d still be the galactic commander, you’d just be docking there to stretch your legs for a spell and get out of your ship. This way, if you wanted, you could have a more traditional method of 4X control AS WELL AS a first person control scheme as well. Anway, hope y’all don’t mind my ramblings, just wanted to get this out there. Thanks for reading! Sins of a Solar Empire: Rebellion Launch Date Announced! Well this is pretty much stardrive, except the action is top down rather than first person. If I get my hands on the Infinity procedural universe engine, maybe we will see this some day! Good grief. Well, no one can accuse you of lacking ambition! Yeah it would be. TOO awesome. It would blow everyone’s minds out the back of their skulls and no one wants that on their conscience. …Oh yea, then I remembered.. SPORE! I never played spore, but I heard it was very disappointing. :/ Welcome to the blog, by the way! Well, that is a shared dream for many people, me included. I’m plotting such a game, COS(chronicles of saba) that incorporates many elements of RTS, RPG, Sims and is FPS. The idea is to have as less limit as possible. The planets wont look as good and big as Infinity’s, the galaxy wont have billions of stars either, but just a few millions. It’s still in early dev, so I’ll keep my mouth shut for now! Next story Squad Wars – Possible Successor to Jumpgate – Announced!! !